Hear directly from Oracle executives Mark Hurd and John Fowler. Learn from an elite panel from Oracle Solaris 11 engineers, led by Markus Flierl, Vice President of Solaris Engineering, Oracle. Benefit from the insight of leading enterprises already using Oracle Solaris 11. Test drive Oracle Solaris 11 and engineered systems in hands-on demos. Meet key technologists and network with your peers during an exclusive luncheon. You’ll take away knowledge of how to build your infrastructure with Oracle Solaris 11 to accelerate internal, public, and hybrid cloud applications, optimize application deployment with built-in virtualization and achieve top performance and cost advantages with Oracle Solaris 11–based engineered systems. We are is what we think, everything that we get is what we effort. with passion and focus we can reach and get our dreams to be true. Everyday in your life, career & social we will face the challenge, the challenge are vary depending on your daily life and your interest… you can take it or lose it. 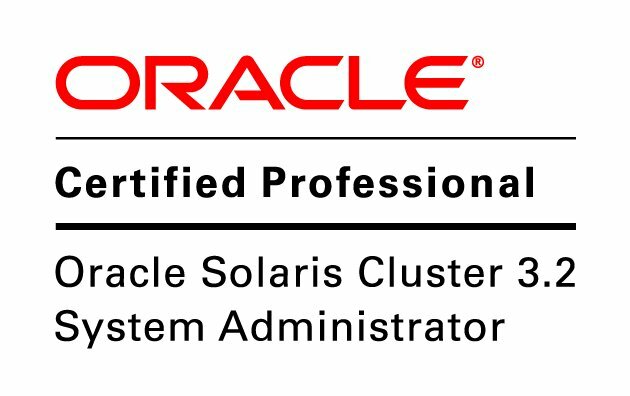 Today I just passed : Oracle Certified Professional, Oracle Solaris Cluster 3.2 System Administrator and this is my new challenge in my career.